Finally, here it is, the review of ‘All the Great Books (abridged)’. Hope you enjoy. 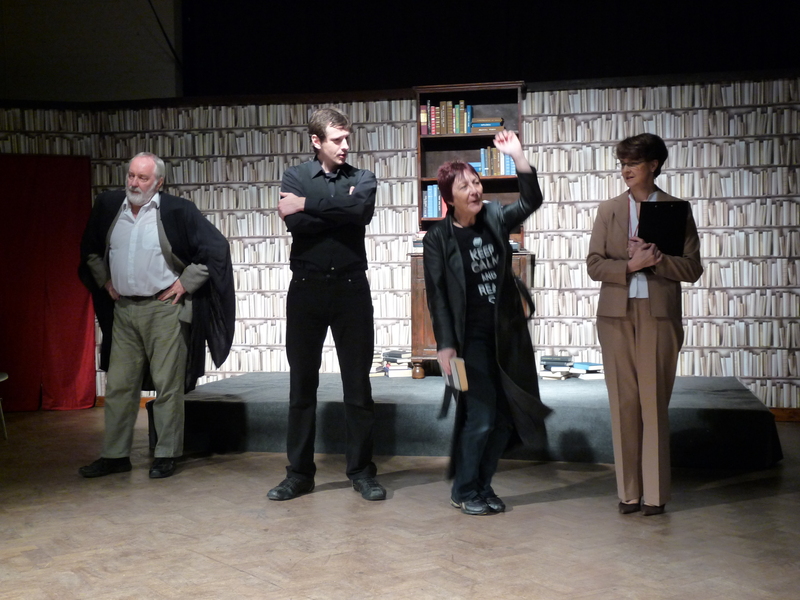 ..Which is why I was delighted to be in St Francis church hall in West Wickham watching the Matchbox Theatre’s 94th production, ‘All the Great Books (abridged)’. What a contrast to my last visit watching ‘Murder Deferred in the sweltering heat! Now, as a veteran of last year’s ‘Complete Works of William Shakespeare (abridged)’ I had a very clear idea what to expect; the bar had been raised high by that production, a magnificent night out and one which had me in stitches. The Matchbox Sized Shakespeare Company would have to work hard to top it. 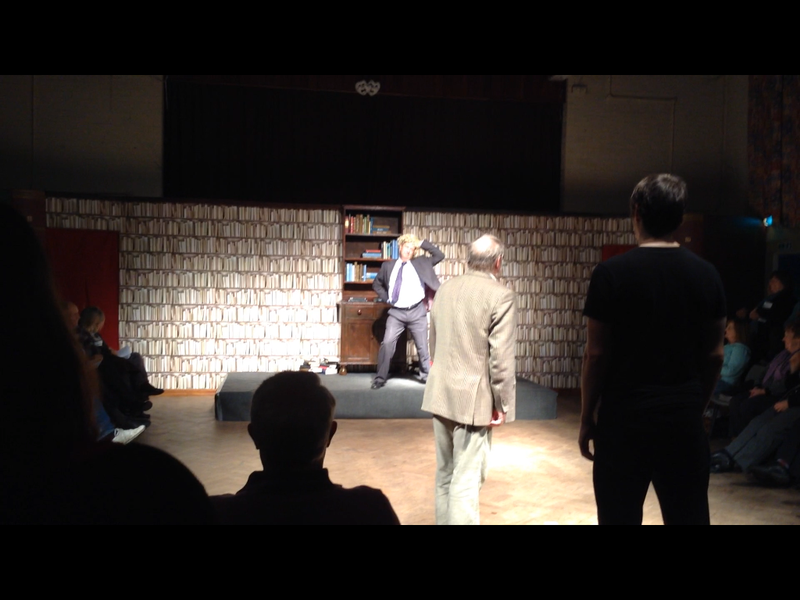 And they certainly started well with the set. The library themed wallpaper and magnificent book spines made for a marvellously evocative background for the action to come and drew the eye of -and many positive comments from – the throngs as they entered the hall. All the while various literary related tunes filled the air as we took our seats; was that a waft of Kate Bush’s ‘Wuthering Heights’ I caught as I came in? I am not sure what the fox does actually say but this rather incongruous piece of music suddenly seemed to fill the hall and then, in style redolent to his entrance last year, James Mercer appeared, informing us to pay attention, turn off our phones and ‘shut that music off’. Yes, the conceit behind this show was a master class in Western literature, indeed eighty nine (yes- I thought it was a curious number) of the greatest books ever written and the familiar faces who so physically took us through Shakespeare 101 last year were to be our teachers. Yes, alongside Mr Mercer, Tim Pearce, Gill Challenger and K Isom were back, and in fine form. As the books were unveiled to the sonorous tones of Strauss’s ‘Thus Spake Zarathustra’ there was something of the delicious and slightly shoddy here, the secret of last year’s success I feel; the proposal of greatness and then undercutting it with the underwhelming or, in many cases, magnificently surreal. Tim entered…sorry…Professor Pearce entered, and proceeded to occupy the familiar role of the slightly pompous academic, inhabiting it with mastery and confidence. Never afraid to work the crowd, he was in many ways an unofficial master of ceremonies for the evening; whether it be holding his own in a wonderful tour de force of collected poetry with a difference, as game show host in a sort of literary ‘Blind Date’, a bucket wearing Don Quixote or his piece de resistance a superheroic Odysseus complete with his own soundtrack- I will remember his trumpeted disappearance through one door and emergence with fanfare from the other entrance for some time! Simple, silly but pure comic genius! K was as ever strong, controlled and again displayed her gift for comedy. A somewhat more aggressive variant of her usual persona, she inhabited the role of short-tempered Mrs Isom with relish, comically unnerving audience members with her moments of anger and her seeming propensity to, shall we say ‘emasculate’ those who crossed her, invariably the unfortunate Mr Pearce. Her rendering of ‘Little Women’ was a delightful sweep through the book in the style of sporting coach delivered with pace and verve and a delicious flourish of the pen which evoked many a chuckle and compelled throughout. In contrast her more minimalist rendering of ‘The Wizard of Oz’ provided another equally memorable laugh out loud moment. Whether wearing fake moustache as Sancho Panza or vampire teeth as Dracula she showed off a versatility and energy which made her a pleasure, as ever, to watch. The man who started the show, James, was as before, the young confident turk of the ensemble, though a little more fresh faced than last year. His performance was assured and he engaged with his swagger and natural charisma. I understand this has been a very busy and successful year for this actor and I can imagine no more fitting a conclusion for him. Just as his compadres, he seemed to delight in entertaining, giving it his all whether it be in his surrealist flying fish interpretation of the American ‘classic’ ‘Walden’ as channelled by Ernest Hemmingway, his wholly memorable turn as a Greek sorceress in the aforementioned bikini and hula skirt or his increasingly frenetic delivery of ‘War and Peace’, he was as eminently watchable as ever he has been and it was a welcome sight to see him back on the Matchbox stage. The foil to these characters was of course Gillian. Now firmly occupying the role of the idiot savant, and one that she plays with such aptitude. Her performance as student teacher was as expressive, exciting and energetic as any I have seen her in. From her first appearance- late again, mirroring her arrival to the Shakespeare experience last year- to her absolutely phenomenal tour de force delivery of a cavalcade of great texts, she was continually in role. No mean feat for any of these actors racing around again at a breakneck pace in one door and out the other with sometimes only seconds for a hasty change of attire, be it a skirt here, a Father Christmas hat there, a seashell bikini elsewhere and, at one point, a hilarious routine with a pantomime horse during a version of ‘The Odyssey’ aptly titled ‘The Idioddity’. Gill acquitted herself perfectly as the front end of this equine dance routine by the way (ably assisted by James) but also in many other roles calling upon a variety of her skills from an outrageously French Paris to the ping pong eyed Cyclops to a Cockney accented Molly Bloom in ‘Ulysses’. A master of the facial expression – the gurn as the director has told me to add- she drew attention even when not speaking, but always in a good way. It was also great to see that her faithful pooch Dylan was back as The Hound of the Baskervilles, although rather than eat you whole on the moors this particular hound performed a bevy of ‘aaahhh’ inducing tricks in between racing off to savage one of the many ‘cannonballs’ filling the stage at that time (you would need to have seen it) all to the sound of Monty Python’s theme. Nonetheless, putting these individual performances under the microscope as we critics are wont to do, is not doing justice to the success of the night, and yes I will make it clear it was a great success. Just as with last year the impact of the evening was down to the alchemy between these four. I can see why the director Mike Savill wanted to ‘put the band back together again’ because the interaction between this quartet was where the magic lay. Energetic and dynamic they would bounce off each other, save each other when lines went awry- not that anyone would care or notice- improvise wildly, interact deliriously and not stop working for the whole 109 minutes of the show. Not quite the 107 minutes promised by the way but I don’t begrudge an extra 120 seconds when this good. And thus to the production itself. As said the set was faultless, one of the best I have seen on my many visits to The Matchbox, simple but wholly effective. Lighting was executed proficiently although a couple of times an actor seemed to be thrown into shadow or illuminated by a rather unseemly green filter at a rather inopportune moment. Sound was also used to impressive effect with a broad soundtrack ranging from ‘The Devil Went Down to Georgia’ to The Beatles with a bit of dance music thrown in, and was that the ‘Conan’ theme I heard in there at one point?! I understand special mention must go to Jane who was manning the sound desk for the first time, no mean feat at all with a production of this sonic magnitude. The vision itself was coherent and unquestionably well executed bearing in mind the limitations of a church hall although it was a little shadowy and, at the end of the day, and here is my one slight reservation about the evening, I can’t help thinking that it didn’t have quite the same novel excitement as last year’s Shakespeare. Maybe that is down to the ‘seen it before’ experience: in a show that goes so many ways with surprise after surprise, audience participation and a continually changing style, novelty is a good thing. Although by no means predictable the events that unfolded didn’t delight in the same bold way they did a year ago. But that is not to say by any stretch of the imagination that it was an issue. My objective that night, besides getting out of the cold, was to enjoy and I THOROUGHLY enjoyed myself in an evening of well executed comedy and blissful energy not usually seen in small provincial amateur theatre. Kudos and credit then to Mike the director, particularly as he was nursing a serious injury throughout most of the rehearsal process, alongside Annie Norris the producer who had the mammoth task of pulling so many of the props, costumes and setting aspects of the piece together. And special mention must go to Vicky Pearce, not only for her catchy programme design but also for the wonderful replicas of the actors which came out during the first half. I would love to have seen more of them. So as I contemplate where I shall frame my certificate for completing ‘All the Great Books’, happily received at the end of the show, I would like to offer my own award to The Matchbox Theatre Group and their MSSC and present to them the prize for the most fun I have had at the theatre in a long time. No certificate I am afraid but performance, I am sure, was its own reward! Anyway, there was much appreciation from me to all involved during the post show curry afterwards and an avowal to do it all again sometime soon. And with that in mind thoughts must turn to our next play, ‘The Accrington Pals’. There are still some issues ongoing there, although hopefully a resolution will be provided soon. And that is not to say that ‘ATGB (ab. )’ is completely done with- photos will be posted in the next couple of days and I hope to have a review by the weekend. Indeed, if anyone reading this feels like submitting a thought or two or even four then you would be most welcome. In the meaantime have a happy Tuesday, I am hobbling off to see Black Sabbath. Catch you later. Oh, and The Matchbox Sized Shakespeare Company WILL return! Just one of the comments overheard from an audience member during the interval of our opening night of ‘All the Great Books (abridged)’ and I genuinely don’t think it was because he had been punched in the kidneys! An appreciative crowd laughed their way through a whistle stop tour of literary masterpieces at relentless speed and a jolly enjoyable evening was had by all. Two nights to go, so if you want to test the durability of your sides or to see why the hapless member of the public pictured above is behaving in such peculiar fashion then make sure you are at St Francis church hall for one of them. 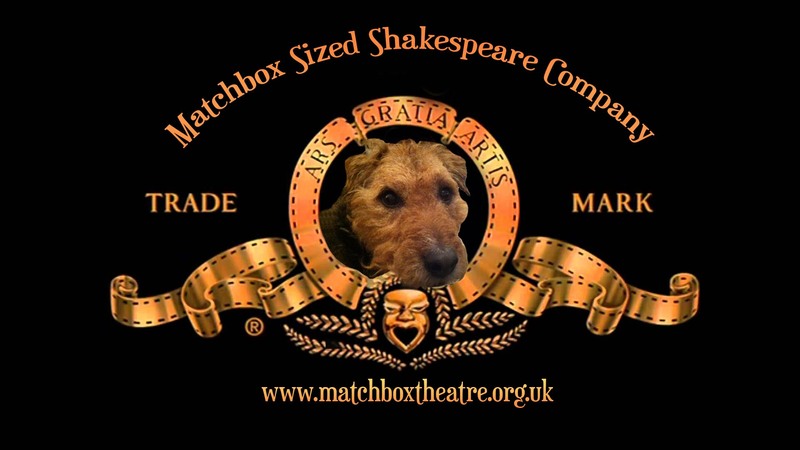 Behold the latest branding for The Matchbox Sized Shakespeare Company. As well as the new logo created by Vicky Pierce that adorns our MSSC publicity, we have this new ident to give a spot of Hollywood style which is more than appropriate for our labours. Executed by a very good friend of mine, Mark Parsons, this affectionate tribute to MGM replaces Leo the Lion with the visage of Dylan the Dog, a true mascot for our endeavours. And such endeavours are nearly over The last rehearsal for ATGB is done and I have to say, I am very excited. Now, of course I am going to say that, I have been working on this with the rest of the team for nearly three months but I genuinely believe that it is going to be a great night of entertainment. There are a few tickets left for each night but they are selling quickly as audience members’ customary realisation of the need to buy tickets kicks in. So if you want an uplifting night out where you can sit back and be entertained with 107 minutes of quick fire comedy scintillating special effects, singing, dancing, a little audience participation and 89 of the greatest books ever written (levels of greatness may vary) for just SIX POUNDS then get yourselves down to St Francis church hall in West Wickham on Thursday, Friday and Saturday. You know it makes sense and it would make Dylan very happy. There is a reason why this play had such a great West End run and you will find that out if you come to ‘All the Great Books (abridged)’. Hope to see you there. Well, the first dress rehearsal is done and we have but one more whizz through all those great books tomorrow before the curtain goes up on Thursday. Rest assured I will be updating with a pre match write up and hope to see some of you there on the 5th, 6th or 7th. The main purpose behind today’s post is, however, looking to the future. 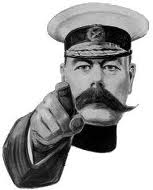 As many of you know our March production will be ‘The Accrington Pals’ and there have been a steady drip feed of auditions and meetings since the 10th November. I am almost ready to announce the cast but we are STILL looking for a young woman to play Eva. Eva Mason (19 – mid/late 20s), a farm girl and Ralph’s girlfriend, who moves into Town to takes over Tom’s role on the stall. A good listener, she becomes May’s confidante. Warm-hearted and genuine, this character has ‘a lovely voice’ and needs to sing a short solo. But more on THAT on the morrow. Have a great Tuesday and see you then.